Invaders come from the East and God’s people surrender. Shield and sword are cast aside as foreign troops receive a warm welcome. Where are the watchmen? Where are the prophets of Yahweh? Do God’s sheep have no shepherds? The soldiers have left their post. Antiochus slays his swine on the altar and no one seems to care. 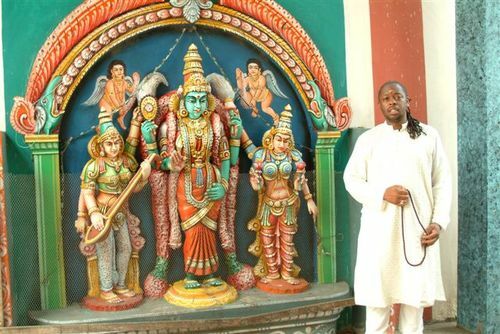 New Thought/New Age guru, E. Bernard Jordan, and his progeny/protégé, Manasseh, have been exalted to places of honor in a temple where they do not belong. “Do you not know that you are a temple of God and that the Spirit of God dwells in you?” (1 Corinthians 3:16). Strange, spiritual incense is burning in the temple and its smell is an offense. “You shall not offer any strange incense on this altar…” (Exodus 30:9). I think, “This can’t be happening,” but it is. After decades of body blows from metaphysicians of various stripes, many Christians have dropped their hands and let down their guard. They fall for anything that promises to make them healthy, rich, and above all, happy. After all, isn’t that what following Christ is all about? If worshipping Baal helps us get better crops, surely the Lord approves. How did we get to this point? The answer involves a long story that gains momentum in nineteenth century America, where religious traditions of various kinds were swirling about and mixing with others in a religious melting pot. The streams of thought that coalesced then had tributaries of their own dating back to ancient times. Primitive magic, animism, astrology, Eastern religion, idealist/pantheist philosophy, mystery religion, Swedenborgianism, Hermeticism, and Mesmerism were among the sources for these nineteenth century cults, and what was formed in the nineteenth century would mushroom in the twentieth. One key, nineteenth century cultist was Phineas Parkhurst Quimby (1802-1866). Quimby did not read very widely, but after rejecting Christian orthodoxy, he became enamored with the theories of Franz Anton Mesmer, becoming a practicing Mesmerist. In time, Quimby became convinced that the real power behind the healings he observed in this practice was the mind of the recipient as he or she engaged in a kind of self-hypnosis. Quimby reasoned that the ultimate reality was Divine Mind and not mundane matter. Whether we are conscious of it or not, our true selves are extensions of this mind, Quimby declared. Furthermore, this Mind was, in itself, an impersonal conduit of nothing but pleasant things. All sickness and suffering was, in his teaching, disharmony with this benevolent force and this disharmony was caused by erroneous thinking. If one could master the laws of right thinking and speaking, they would be practitioners of a new kind of science — a science of Mind. Quimby’s most successful, immediate, spiritual descendants, Mary Baker Eddy  and Warren Felt Evans (a Swedenborgian minister) further radicalized Quimby’s teachings, introducing more Hindu-like thought into the system. All humans are deity in this mind science scheme and matter is either unreal (Eddy – echoing the Hindu doctrine of Maya) or less real than Mind (Evans). Eddy formed a tight knit group that maintains her heritage to this day – The Church of Christ, Scientist (also known as Christian Science), and she influenced several prominent figures in the New Thought branch of Mind Science. Evans, along with similarly inclined metaphysicians such as William Walker Atkinson, Emma Curtis Hopkins, and Thomas Troward, became foundational to the less organized, New Thought branch. One of the best known of the groups that formed within this New Thought matrix was the Unity School of Christianity, founded by Charles and Myrtle Fillmore in 1889. In the twentieth century, various New Thought practitioners, including Napoleon Hill  and Norman Vincent Peale,  created a broader market for New Thought, as they presented it in a more subtle form as a kind of self-help. Consequently, the early Black cults often followed charismatic and highly exalted leaders. After emancipation in 1863, middle to upper class African-Americans with religious inclinations largely gravitated to segregated versions of the White churches (the origin of such things as the Black Baptist and Black Methodist churches). Some of these Black Americans joined themselves to less orthodox “Christian” religions that gathered around a deified leader. In 1899, Baker came under the influence of an African-American mystic who called himself the Reverend St. John the Divine Hickerson. 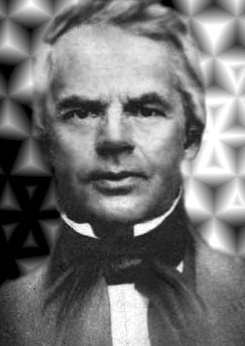 Christian Science had influenced George Baker’s theology to some degree and he became quite enamored with the New Thought teachings of Charles Fillmore and the Unity cult. This cult’s deification of adherents, as well as its promise of prosperity appealed to him. It was left to a later Mind Science figure to make Father Divine’s style of metaphysics a bit more palatable to thinking people and thus broaden the market for this expression of New Thought. Frederick J. Eikerenkoetter, better known as “Reverend Ike,” parroted Mind Science theology in a purer fashion than Father Divine and Ike offered his followers deity equal to his own. Ike’s teaching would supposedly enable all of these gods to get their wealth and happiness now, as they would seek first riches now and take their eyes off of “pie in the sky” (in other words, the hope of heaven which Peter exhorts us to put our eyes on – “…fix your hope completely on the grace to be brought to you at the revelation of Jesus Christ” [1 Peter 1:13]). E. Bernard Jordan would have us accompany him on a trip back to Carey’s India that we might be converted to the heathen darkness Carey laid out his life to illuminate with gospel truth. 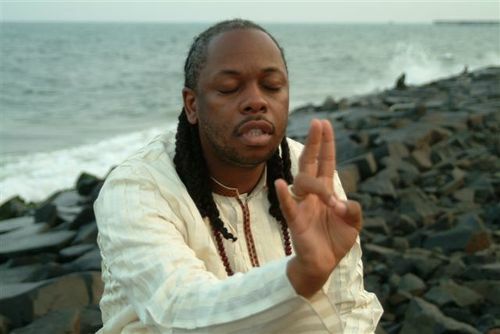 The “prophecology” of Jordan’s “Prophetic Order of Mar Elijah”  is a blend of various heresies and false religions, and E. Bernard Jordan has reached back to revive another, ancient tradition to mix with New Thought, astrology, and Hinduism – the tradition of the false prophet among God’s holy people. I have engaged in a futile attempt to ask E. Bernard if those who cannot afford a prophecy might get one for free. If there is a way to obtain a free, personal “prophecy” from him, I have not found it. “And the prophet who teaches falsehood is the tail. How can such blatant cultists be welcomed into the church? For the bulk of his career, E. Bernard Jordan has exploited, for the most part, people who wandered into the fringe, religious experience. His son Manasseh, however, speaks before large gatherings of supposedly Evangelical Christians. Who let the bad guys in? Benny Hinn did and he didn’t do so out of ignorance. Therefore, come out from their midst and be separate,’ says the Lord. E. Bernard and Manasseh Jordan are enemies of the gospel. Their talk of prosperity, power, and prophecy ultimately points us to the Jordans themselves and to a mystical power within us. These sheep-fleecers preach and teach dark, cultic doctrines in the house of God. They would likely not have gained entry in that house, however, without the help of their good friend, Benny Hinn. Benny Hinn has brought Satan into the sanctuary. He has defiled the Father’s house. He is a traitor to the Kingdom of God. Unless the church responds with an impassioned house cleaning, we will leave the floodgates open for more false prophets to enter. Manasseh Jordan represents a new level of boldness in the enemy camp. The enemy has infiltrated our ranks in disguise since the days of the early Gnostics and we have seen many of these wolves in sheep’s clothing in recent decades. The infiltration of a brazen New Thought/New Age mystic/prophet into the church wearing practically no disguise (other than his redefined use of the words “Jesus” and “salvation”) represents a devilish effort to establish an open, conscious alliance with the church. The wolf has dropped his sheep’s clothing. If we yawn in the face of such treason and treachery, what will we say to the other wolves who are emboldened by our lackadaisical response to E. Bernard Jordan, Manasseh Jordan, and Benny Hinn? Why fuss over what three men are doing? First, what they do is big in principle. In his sermon “Little Sins,” Charles Spurgeon illustrates how something small in number can transgress in an especially great way: “It is not necessary to send a hundred thousand troops into a country to break a treaty. It is true the breach of the treaty may appear to be small; but if the slightest breach be allowed, the principle is gone. There is very much more in principle than men imagine.”  Even a very small thing can have great significance. With a great principle involved, even a single grain of incense can have tremendous import worth dying for. The principles involved in corrupting the church and deceiving God’s people with cultic “influences from the east”  are very great ones. Thirdly, these three men are symptomatic of a more wide-spread infection. They are just an extreme symptom of a sickness that pervades the body in different ways. Man-centered teachings that deify men, sanctify their greed, and ascribe various, metaphysical powers to them are like flesh-eating bacteria in the church. The severity of this latest symptom shows just how bad the problem is. Finally, the Jordans are pioneers and if we let them blaze a trail, many other false prophets will follow. Any substitute teacher knows that when they first arrive in a new class, there will be a daring, rule-breaker who tests the waters. The rest of the class will be watching to see how the substitute handles the pioneer’s misconduct. If the teacher backs down and lets the pioneer do whatever he or she wills, others will be quick to follow suit and lawlessness will ensue. Everyone is watching the church’s response to the Jordans. This article was written by David Kowalski, a member of the Apologetics Index team. David has worked as an English teacher (Abeka), high school administrator (ACE), in-school-suspension teacher (public school), Associate Pastor (two Assemblies of God churches), Senior Pastor (two Assemblies of God churches), and Bible College Professor (Global University). He has written a number of articles, including two in the “Encyclopedia of Pentecostal and Charismatic Christianity,” published by Berkshire Publishing. Some of his articles at Apologetics Index include, Postmodernism and the Emerging Church, Interacting with Emerging Church Culture, and What to tell one of Jehovah’s Witnesses concerning the Trinity. You can interact with David Kowalski at his Google+ page. George Baker/Father Divine himself is largely responsible for this confusion. After receiving rough treatment at the hands of several authors, he refused to cooperate with researchers and historians. Jill Watts writes that Father Divine did so on the basis of his ineffable deity: “…he insisted that it was impossible and inappropriate to write his biography. ‘Man cannot define God and cannot write a true history of him,’ he told one prospective author.” Jill Watts, God, Harlem, U. S. A.: The Father Divine Story (Berkeley, CA: University of California Press, 1992), xiii. Information surfacing at this late date through Baker’s widow, “Mother Divine,” and members of The International Peace Mission Movement may not be entirely objective (see such material at http://www.libertynet.org/fdipmm/ [accessed 9-23-2012]), but the quote used by Jill Watts is originally found in a book by Mother Divine: M. J. Divine, The Peace Mission Movement (Philadelphia: Imperial Press, 1982), 114. Orrel Steinkamp has written some insightful articles about modern, false prophets who sometimes display supernatural but not divine abilities: http://www.deceptioninthechurch.com/orrel19.html http://www.deceptioninthechurch.com/orrel35.pdf. I have personally witnessed such things. “Test the spirits to see whether they are from God” (1 John 4:1 NASB). It would also be foolish to rule out the possibility of the slick techniques of scam artists when questioning the supposed abilities of someone like Manasseh Jordan. Peter Popoff has been exposed for using deceptive techniques that caused him to appear to have supernaturally given knowledge, which had actually been transmitted to his earpiece from his wife who had obtained the information from people as they waited to enter the meeting. http://www.youtube.com/watch?v=UUN9FNywMVk, http://www.youtube.com/watch?feature=endscreen&NR=1&v=_vkW8VYj6NA. I enjoyed your article. I am pentecostal pastor in Auburn, Alabama. I recently wrote a book about these new age practices in the church. It is entitled The Polluted Church: From Rome to Kansas City. Thanks for taking a stand. thank you for the artile and supporting scripture. well done! the church needs more who are willing to take a stand for the truth and to get the “world” out of us. I do question though if Benny Hinn is my brother. in my view he is just as false as those in the article, thus i would challenge that he let something in Gods house. God is not dwelling within benny. Thanks for the kind words. Dean, I look forward to reading your book. Bradley, I understand your feelings about Hinn. In showing how Manasseh got his introduction to the church, I chose not to evaluate the sincerity or orthodoxy of Hinn’s faith. Whatever one thinks about Hinn, he is, unfortunately, able to influence many participants in the charismatic movement, and without his help, Manasseh would have had a harder time getting an audience with believers. Thank you for this article, David. I am so glad that Apologetics Index provides this kind of information which is hard to come by elsewhere. I’m especially impressed with the documentation since that allows others to verify the information. So many Christians appear to have no discernment whatsoever. Witness the popularity of people like the Jordans and Benny Hinn. Oh, I did have to look up who Antiochus was. This article has been very valuable in getting a brother in the Lord to reexamine his support of the Jordans. Thank you Mark. Your comment alone causes me to consider the work I put into the article worthwhile. And Charles: I did think twice about using the reference to Antiochus. I’m glad you looked it up! Thanks for your comment, TraBell. I did not know that Bernard was in the habit of calling people at their homes. No doubt it was to say he had a prophetic message just for you, provided you gave a sufficiently large “love gift.” I would consider this a form of harassing, telephone solicitation. I was on his email list for a while but when I persistently inquired as to whether or not someone could get a free prophecy from “The Master Prophet,” the emails completely stopped! Christians should be speaking against any and all false prophets. One problem today is that so many have crept into the public view and mix truth with lies that most people can’t see through the muck and mire. Thank you for speaking out. I agree that we have, to an extent, become used to this sort of thing. How else could something so blatant and extreme barely cause a stir? Thanks so much for sharing your story as a warning for others. I assume you are speaking of E. Bernard. He must be using the one, “free” prophecy now as a kind of hook to ensnare people and exploit them through an endless line of “prophecies” that they must “sow” (pay) for. I am so glad to hear that God delivered you out of this. That is so good to hear. If there is no way to unsubscribe from his emails you should be able to set a filter for all emails coming from him to go directly to spam or trash. It might not hurt to both unsubscribe and set a filter. I strongly suspect that E. Bernard and the site that promotes Rev. Ike’s materials share email lists. You may need to do something similar to stop emails from the site that promotes Ike’s stuff if you are getting emails from them. I’ve heard that E. Bernard has made phone calls to some people he considers good prospects. If he did this to me, I would tell him I believed he was a false prophet and a cult leader, and that I considered his calls a form of unwanted and harassing telephone solicitation. Minister, Kowalski, I thoroughly enjoyed the well written information on false prophet and their malicious intent to deceive. I had never heard of E. Bernard and his son, Manasseh. I will do some research on them to find out more about these New Age prophets. Thank you for warning people about occultism. May God continue to bless the work you are doing for Him. Have a bless weekend. Take care. Thanks, Cynthia. Perhaps the greatest danger with the Jordans is that they are spiritual chameleons. Bernard, for example, has several websites, some more “Christian” than others. 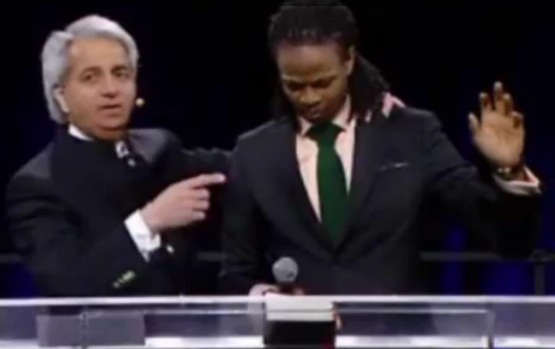 If you have ever seen Manasseh minister with Benny Hinn (I give some YouTube links in the endnotes) he is quite skilled at sounding like a good, Pentecostal, Christian. 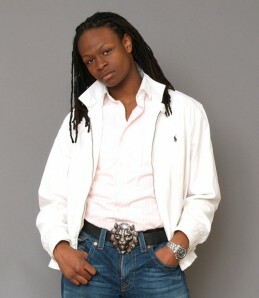 The Jordans cater their “minsistry’ to appeal to various kinds of audiences, but Manasseh has found it very profitable to adapt his wording to the crowd Benny Hinn has introduced him too. An interesting thing to do when watching Manasseh is to note what he does not say. He speaks a great deal about God’s “blessing” but it is quite odd that a supposed prophet never talks about obedience beyond obeying “God’s voice” in giving money to the “ministry.” He also never says anything to contradict the mind science teachings of his father — teachings he has openly endorsed. I was a “member” of Jordan’s so called church, and quickly left I do not have enough time to write about how evil this church is. When you are involved in a “deeper” level you begin to discover so many eye openers. One of his top “Prophets”, Robert Meola, which happened to be my husband, molested my daughter for five years of her childhood life. He is still allowed to “work” with Jordan, even through an open investigation of this matter. I pray God takes down the Devils army soon. Sorry to hear of your terrible experience. I pray that God brings consolation to your heart. Please pray and i will agree with you..i have been with these people for 10years and every year i get deeper and deeper into dark paths ,people i meet are from dark spirits its sickening no matter how i pray i keep falling off..i hope almighty God didnt turn his back on me.please pray.. I have already prayed for you and will continue to do so. More importantly, you have an advocate in Christ who cares for you. Certainly the enemy does not want to let you go free from the clutches of this deception but he is no match for the almighty who sets you free. I do not know your circumstances but if part of your problem is continuing influence from people caught up in error (“people i meet are from dark spirits”) I would suggest you do all you can to distance yourself from them. Thank you very much! A ministry friend of mine got the book The Laws of thinking in 2010. He wrote an article and exposed the numerous false teachings in the book. I personally reacted on the video about Bernhard E Jordans trip to India. 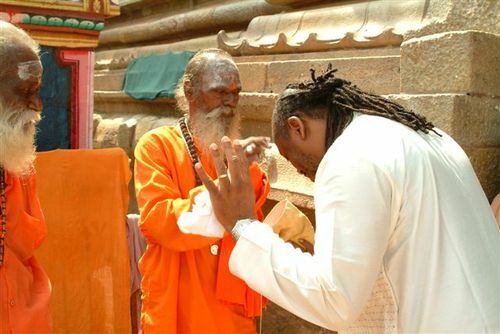 He went there to receive powers (demons) from Hindu Gods. Sad to stay that some pastors have no problem with the book and even received laying on of hands by false prophet Manasseh Jordan. This is fulfillment of Math.24 where Jesus propheceied that many false Prophet would come to deceive. The Jordan Manasseh ministry has continuously (and successfully) harrassed my mother into transferring a total amount of more than 30,000 (yes, thirty thousand) US dollars so far, to unaccountable, unknown persons all around the world, Nigeria, Kenya, Malaysia, at the false pretense of supporting orphanage homes. They duped her into believing all this money is first needed there in advance for all kinds of made up certificates and insurances required to prepare a return transfer of about $125,000 from a so-called “diplomat”. That money supposedly has been reserved for her to build a new orphanage home in Germany. When I confronted them with the fact that their practices seem fraudulent to say the least, they simply dismissed my concerns by saying I knew nothing about finances. My mother knows and has met Manasseh Jordan and his administrative assistant Grace Ojes personally. She completely trusts them and won’t stop dumping money into this scam. She is by no means rich and has already applied for bank loans so she can keep funding this madness. I am devastated to see my pure of heart mother being exploited in this way, yet I can’t stop her, she appears like a drug addict to me. I’m sorry to hear about your mother. This must be devastating and I will pray for her. It is especially hard to validate overseas expenditures, but it is illegal to raise funds for a specified purpose if all of the funds are not used for that.